The simple tomato “sauce” that starts this dish off has more flavor than seems possible with such simple ingredients. Romano beans stand up particularly well to the braising necessary to get all that flavor into the beans, but regular green beans, wax beans, or other pole beans aren’t too shabby cooked this way either. Crispy cooked vegetables, the kind that are more heated up than cooked, may be the rage with plenty of people, but I'm one to embrace a wide variety of techniques. 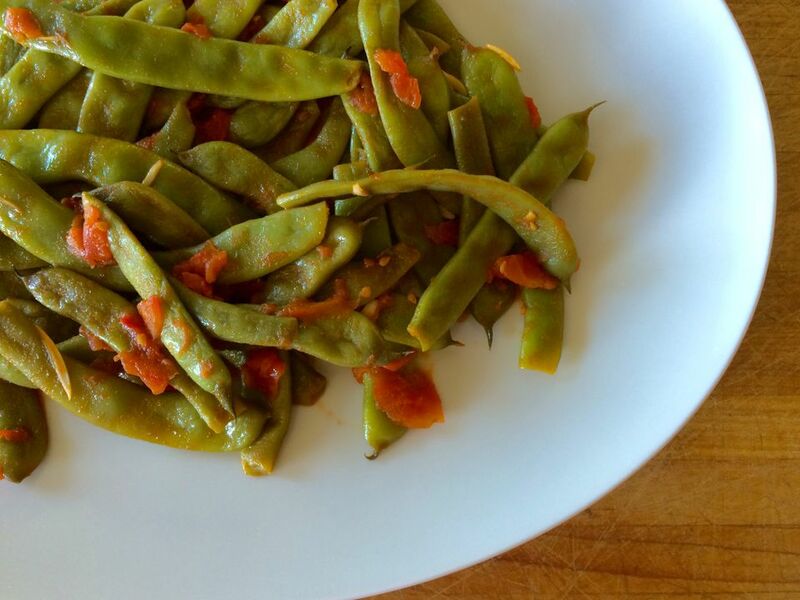 Crisp-tender steamed green beans are great, but so, too, are these supremely tender and flavorful beans. Trim off the ends of the beans. If you like, cut the beans into bite-size pieces. Set the prepped beans aside. In a large frying pan or saute pan over medium heat, heat the oil and add the garlic. Cook, stirring, until the garlic is wonderfully fragrant and just turning golden, about 2 minutes. Add the tomatoes and salt. Cook, stirring frequently, until the tomatoes start to break down, about 4 minutes. Add the trimmed beans. Stir to combine everything. Cover, reduce the heat to medium-low, and cook undisturbed until the beans are very tender and the oil and tomato liquid have separated, about 20 minutes. Remove the cover. If you want to add some fresh herbs, now is the time to do it—the dish will get their flavor but they won't cook so long that they turn muddy. Increase the heat to high and cook, stirring occasionally, so any excess liquid evaporates. The tomato should cling to the beans and the beans will be fully tender and won't be bright green, but a faded. Serve the beans hot, warm, or at room temperature.